Do Your Statins and Grapefruit Safely Mix? Do you take statin medications to lower “bad” LDL cholesterol? 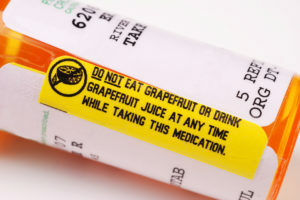 Eating grapefruit while taking these drugs can increase the risk of side effects. This warning has led to a lot of questions from people taking this type of medication. Stanley Hazen, MD, PhD, Preventive Cardiology Head at Cleveland Clinic’s Heart and Vascular Institute, says it’s a frequent topic of concern. “Patients often ask about grapefruit and statins — and whether they can eat the fruit or drink the juice when on statins,” he says. Luckily for grapefruit fans, there are cases in which moderate amount should be safe. It’s true that changing your diet and lifestyle can help bring down LDL levels, but sticking to a strict diet and exercise regimen isn’t easy. Statin medications work steadily and reliably to help regulate LDL levels — even if you come up short on exercise or indulge in a slice of cheesecake once too often. And statins help keep LDL levels in check for those patients who find simple diet and lifestyle changes are not enough. As with any medication, taking the correct dose of statins is important. High dosages are correlated with increased side effects. What problems come from grapefruit? Grapefruit contains a chemical that interferes with your body’s ability to break down or metabolize certain statin medications. When statin takers eat large amounts of grapefruit, the level of statins in their blood can increase, raising the possibility of side effects. Problems can occur for those who are sensitive to statin medications or those who have kidney disease or other illnesses. Side effects from grapefruit-statin interaction can be mild, such as muscle and joint pain. Severe side effects include muscle fiber breakdown and kidney failure. Cardiologist Steven Nissen, MD, points out that only certain statin medications interact negatively with grapefruit. “This is an issue only for lovastatin and simvastatin and is only problematic at the highest dosages,” says Dr. Nissen, Cardiovascular Medicine Department Chair at Cleveland Clinic’s Heart and Vascular Institute. There are several studies about grapefruit and statin interaction, and recent ones suggest that moderate grapefruit consumption can be compatible with taking lovastatin and other statin drugs. 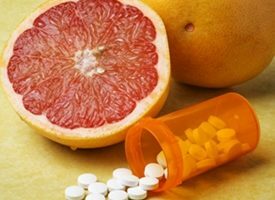 There is no absolute consensus about how much grapefruit a person can safely eat while taking statins, but Dr. Hazen takes a measured approach with his patients. Dr. Hazen says the original studies linking grapefruit ingestion to delayed statin metabolism involved over two quarts of grapefruit juice per day. “A more reasonable level of grapefruit consumption has been shown to result in far less effect on statins,” he says, adding that patients should still talk with their doctor before eating grapefruit if they take statins.